Now that the proposal has been completed I can safely give a little more information about what it is I am trying to do with this paper. To refresh everyone’s memory, I am doing research on the Chinese Hip Hop movement. Specifically, I am going to study the history of Hip Hop (first here in the US and then in China) and determine what role censorship holds in both those stories. As many of my sources have suggested, Hip Hop is a way for people to express themselves – freedom of expression in China can be difficult. The underground hip hop movement is a good example of Chinese censorship because unlike in the US where popular music artists enjoy good money for their performances, Chinese Hip Hop artists can not make a living off of their craft. They are censored by the government and are forced to multiply their fan bases by small live performances and online videos. So far it’s been very interesting – so I am looking forward to delving further. The Gate of Heavenly Peace was a very long film. I have to say this first because I honestly was disapointed when the second tape had to be put in. Although it was very long, I found no trouble being engaged by it. The interviews of actual participants were very moving. I especially enjoyed hearing different perspectives from teachers, students, workers, and pop artists (all involved in the movement in some way). Above all else – I felt that this documentary really confirmed that my limited knowledge of Chinese government action and history of China has been well guided – censorship, corruption, and unwillingness to allow its people to form their own opinions are just a few negative aspects that can be taken from this film. I am also reminded that history can be changed by those currently in power… this incident is not recorded as it was to the students – it is how the party wants it to be remembered. Everyone else is punished to think or say differently. One aspect that I found particularly interesting was the involvment of musicians. My own research has led me to believe that music (Hip Hop specifically related to the 2000s) does have a profound effect on people. Music represents freedom of expression and allows individualism. I felt that this point was made in this film as well, and I like that Pop artists could serve this purpose. Today, from my hip hop resources, it seems that most pop artists are conforming and self-censoring to be compatible with government ideals – and not to be restricted by the government. I had read about Rock performers being influential and standing up to the government – but that is not all that surprising given the history of Rock and Roll. Rebellion and teenage angst is something that comes to mind. Hip hop to me also represents a sense of rebellion and individuality – fighting against the odds. Pop on the other hand doesn’t tend to (stereotypically at least in my own mind) fight the power and break the rules. I enjoyed learning about an exception to this preconceived notion I had. This research based website will include an in depth description of the first patented American gum vending machine by Thomas Adams in 1988. There will be a tab for the antecedents, the invention itself, its political and social impact, alternatives and competitors in the vending market, a photo gallery, and a bibliography. In the years before Adams’ Chicle Gum machine, no American had patented a vending machine, but various attempts and versions of machines had been made elsewhere prior to 1888. This site will investigate the first recorded vending machine, which dispensed holy water at church in ancient Rome and was designed by Hero Cstebus in 215 B.C., as well as more modern antecedents such as London’s 1857 postage dispensers. Specifically, this site will focus on Adams’ machine which was patented in 1888 and enjoyed relative success in the early limited market. Adams’ success was largely due to his choice of location for his vending machines-a large New York City transit station. It is also important to note that Adams’ is credited with the invention of chewing gum as well, which coincides with his invention of a gum vending machine. American’s embraced chewing gum eagerly and this fueled the success of early vending. 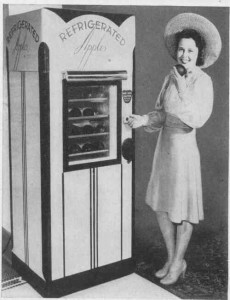 Following Adams’ machine, the vending machine production in the United States increased exponentially. This site will delve into the growing vending market as well as the social, economic, and political impact of these inventions. While the products within them varied, vending machines became more and more popular through the years. For instance, the earlier years of vending were dominated by gum and chocolates. By the 1930s, cigarettes became the major product and were soon joined by coffee and cola. As technology allowed, machines became more complex, with mechanical arms, anti-theft devices, and heating or cooling systems. Vending machines meshed seamlessly into the consumer society that American’s were beginning to know and love. Inexpensive, accessible, and fast refreshments were widely sought after, and thus there was a vast desire for vending machines. Both primary and secondary sources are critical to this analysis. Primary sources will include newspaper and journal articles about the vending machines and their impact during the time period in which they were introduced and most popular. For example, a New York Times article from 1950, “Coin-in-the-Slot,” discusses the growing popularity of vending machines and the optimal placement of these machines in transit centers. Another article, “Jobs Galore for Robots” by Chris Rasmussen (2001), describes how service jobs are being taken up by machines rather than people. In addition Rasmussen describes the growing problem of “slugs,” which were either fake money or coins on strings to steal products from vending machines without paying for it. This crack down on “slugs” led to a whole new line of vending machinery, which is relevant to the impact of Adams’ initial invention. Secondary sources give context for a more broad history of vending units. The most comprehensive history of vending machines available is Kerry Segrave’s Vending Machines: An American Social History (2002). As one might infer from the title, Segrave’s account covers a great deal of the social impact of these machines in addition to the technical and economic side of vending. Another helpful source is Michael Colmer’s The Great Vending Machine Book, which in addition to a substantial history of vending in the United States, also features photographs, articles, and original advertisements of numerous machines. In addition, various other sources will be utilized for this research to be complete. In conclusion, the history of Thomas Adams and the first patented vending machine in the United States is complex. This research project will cover more than the invention itself. It will encompass its antecedents, the social, economic, and political impact of the invention, competitors in the field of vending machines, and hopefully a greater appreciation for the seemingly simple machine that many people world-wide use every day. Aranow, Martin. “Complaint on Vending Machines.” New York Times (1951): ProQuest LLC. Aranow expresses the growing discontent with some vending machines that were not tended to properly by service staff-empty and broken machines were often a problem for customers. “Coin-in-the-Slot:New vending machines are harvesting millions–and the end is not yet.” New York Times (1950): ProQuest LLC. This article reports the success of vending machines in transit stations and provides a hopeful outlook for the future of these machines. “Chewing Gum Bill Rises.” New York Times (1928): ProQuest LLC. The New York Times reports that Americans spent $54,117,121 in 1927 on chewing gum alone; most of these profits were made by vending machines. McMahon, J.E.. “Jingle of Coins in Pockets Gains: Increases in Sales Taxes, Vending Machines Bring Shift in Money Usage.” New York Times (1959): ProQuest LLC. Vending machines are considered a leading cause for more Americans to use coins over bills. Rasmussen, Chris. “Jobs Galore For Robots.” Rethinking History 5, no. 1 (2001): American History and Life. Rasmussen describes the process of industrializing the service industry machines are taking the service jobs from people. In addition he addresses the problems with mechanical service such as theft and out of order machines. “‘Third Evolution’ Seen In Vending Machines.” New York Times (1968): ProQuest LLC. Due to the ongoing success of vending machines, this article reports that more vending machines will be in use in the next five years and will be installed in a variety of different places, such as truck stops and cafeterias. “Vending Machine Manufacturers Expect Normal Output This Year.” New York Times (1947): ProQuest LLC. The New York Times reports that in the post-war economy, the shortage in industrial supplies is no longer a problem, allowing vending machine production to climb back to pre-war capacity. “Vending Total to Grow: Machine Producers Look for Trade to Treble in Two Years.” New York Times (1931): ProQuest LLC. The New York Times reports that vending machine business is flourishing, and they believe that as the number of machine increases, so will the profits made in this industry. Walker, Waldo. “Slot Machines Amass Riches From Pennies.” New York Times (1927): ProQuest LLC. The New York Times reports that literally tons of the “lowliest coins” are being collected weekly by vending machines. Cadbury Adams USA LLC. “Story of Thomas Adams.” I Love Gum. Available from http://www.ilovegum.com/Story.html. [accessed February 10, 2009]. An account of Thomas Adams’ trial and error in his invention of chewing gum, which was later advertised in his vending machines. Colmer, Michael. The Great Vending Machine Book. Chicago: Contemporary Books, 1977. Colmer’s history is comprehensive of the early American vending machines, and includes various primary sources, such as photographs, advertisements, and original designs. Drachmann, A.G. The Mechanical Technology of Greek and Roman Antiquity: A Study of the Literary Sources. Madison, WI: University of Wisconsin, 1963. Drachmann describes countless ancient Greek and Roman inventions, many of which were the antecedents of modern day inventions such as Hero Cstebus’ holy water vending machine. Emmins, Colin. Automatic Vending Machines. Cromwell House, UK: Shire Publications Ltd., 1995. Emmins gives a similar report to Schreiber’s 1961 information with the addition of more current information on decimalization and the electronics involved in vending. “How Thomas Adams Became a Business Leader When He Invented Chewing Gum Almost by Accident.” A Touch of Business.com. Available from http://www.atouchofbusiness.com/business-topics/success-stories/business-leader-thomas-adams-0035.html. [accessed February 8, 2009]. A Touch of Business provides an encouraging story of Thomas Adams, the young entrepreneur and inventor, in a business minded format. Marks, Norton. Vending Machines: Introduction and Innovation. Austin, TX: University of Texas, 1969. Marks discusses the history of vending machines, but focuses primarily on a specific study of the social impact of big vending business on Americans. Marshall, Martin V. Automatic Merchandising. Boston, MA: Harvard University, 1954. Schreiber, G. R. A Concise History of Vending in the U.S.A. Chicago: Vend Magazine of Vending Industry, 1961. Schreiber provides a precise history of world wide vending up to 1960 which includes a fair amount of detail on America’s first vending efforts, namely Thomas Adams’ work. Segrave, Kerry. Vending Machines: An American Social History. Jefferson, NC: McFarland & Company, 2002. Segrave’s book is a superior source on the overall history, including social, political, and economic context for vending machines in the late 1800s through present. Visual Analysis – Proletarians of the World Unite! "Proletarians of the World Unite"
This particular poster stood out to me because of it’s incorporation of three different races defending the same cause. The image is very strong – the red and the black are particularly eye catching, not to mention representative of Red China. It appears that each of these soldiers is carrying the same doctrine, Chinese red lettering is on each of their pamphlets. From the left, there is a Caucasian-looking soldier, a Chinese or Asian soldier (though it is probably safe to assume Chinese here due to it being their positive propaganda), and a black soldier (assumed by me and the describer from the kaladarshan arts site to be an African). The brief information given from this site seems insightful. 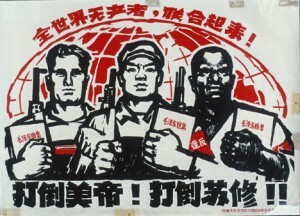 It states that these three soldiers represent an international community that is unified against its “oppressors.” It is assumed that this message is implying that all races and nations should join the fight against American imperialism and Russian revisionism. By standing united, these soldiers represent the harmony that could be acheived if China could lead the way into the future. The Chinese soldier stands in front of the other two men, and is also in the central-most position of the poster, representing leadership, power, and superiority. Despite the Chinese soldier’s superior positioning, the cartoon image of both the Caucasion (“American”) and the Black (“African”) are well defined and flattering. They are strong soldiers with sharp muscular tone and serious demeanors, serious to the cause that they are defending side by side with the Chinese soldier (pamphlets in hand). They are also equipped with the same guns, which can deemed to be another sign of their equality and unified effort. They are one army with the same goal in mind – each soldier looks determined and faces the same direction staring. I personally found it odd that this propaganda is implying semi-equality between races. I guess I assumed that the Chinese, like most nations, assumed superiority. At the same time, that superiority is still somewhat intact due to the Chinese soldiers positioning as afore mentioned, and the fact that the whole world is changing its ways to those of the Chinese. This just serves as a reminder that cartoons and pictures can be analyzed in many different ways – it depends on the biases and knowledgability of the analyzer (who in this case is me, and I have some more Chinese studying to do). You are currently browsing the Eweaver’s UMW Blog weblog archives for February, 2009.